For the original Natural Product Forum I had compiled a list of journals, bloggers and tweeters covering natural product research. This list can now be found here. If you find some journal / blogger / tweeter is missing but should be on the must-read-list of any natural product scientist, please comment – I will then add your suggestion to the list, keeping it up to date. For me it just remains to say that the development of Eribulin from Halichondrin B was a real game changer in the Natural-Product-To-Drug arena. One of the strongest argument against natural products in drug discovery has always been “It might be a nice hit/lead, but it will never be possible to synthesise such complex compounds economically”. Eribulin simply proves that this is not true. Despite being still rather complex and still having about 20 stereocenters, it is economically feasible to manufacture the compound. In 1972, it was discovered that extracts of the sea hare Dolabella auricularia showed pronounced antineoplastic activity. 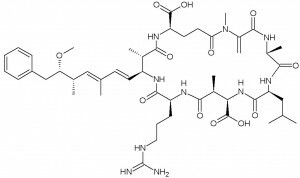 Due to the vanishingly small amounts of active substances in the slug, it was not until 1987 that the structure of the most potent compound in this extract, dolastatin 10, could be elucidated: 1 ton of mollusk biomass was collected from the wild to isolate just 29 mg of dolastatin 10 (structure below)! But honor to whom honor is due – it has later been found that the dolastatins are in fact produced by the cyanobacteria Symploca hydnoides and Lyngbya majuscula, which are part of the sea hare’s diet. At the time of their discovery, the dolastatins were the most potent antineoplastic substances known, with an ED50 in the picomolar range against a number of cancer cell lines. The dolastatins have been found to bind to tubulin close to the vinca binding site, thus disrupting microtubule function. 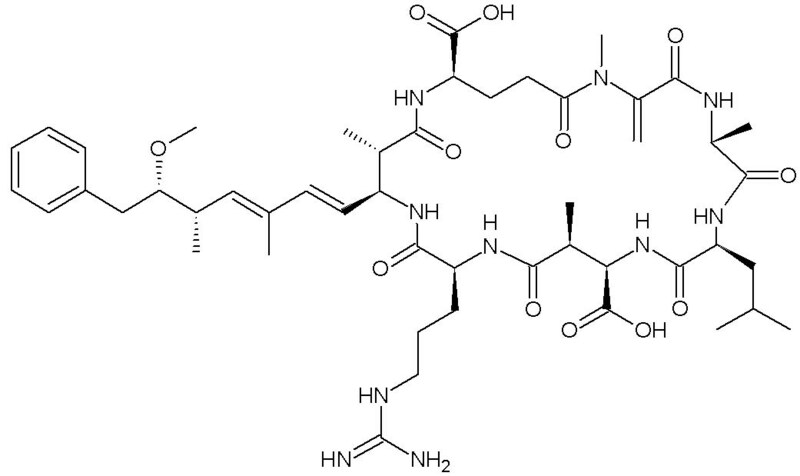 As the chemical structure of dolastatin 10 is comparatively simple, the development of the compound luckily did not depend on the natural source. The first total synthesis was already described in 1989. Although the natural dolastatins show remarkable activity in vitro, their in vivo activity as a single agent is not sufficient for direct application as drug substances at dosages where toxic side effects are still tolerable. Numerous synthetic derivatives have been generated, and extensive structure–activity relationships have been established. By 2008, two derivatives, namely tasidotin and soblidotin, had been advanced into phase II clinical trials, but although these compounds were much better tolerated, they still failed concerning their efficacy against the tested cancer types. However, as tasidotin is well tolerated, metabolically stable, water-soluble and orally bioavailable, it is still followed up in other cancer types and in combination therapy. Monomethylauristatin E (MMAE) is a synthetic dolastatin 10 derivative with pronounced activity and toxicity. Researchers at Seattle Genetics developed a technology to couple MMAE analogs to monoclonal antibodies. The antibodies can be targeted against various cancer cell-specific surface antigens such as e.g. CD30, found on several lymphoma types, Nectin-4, expressed by multiple cancers such as bladder, breast, lung and pancreatic cancer, or glycoprotein NMB, found on breast and melanoma cancer cells. These antibody–drug conjugates (ADCs) are stable in extracellular fluids and relatively non-toxic, because the toxic effector MMAE is covalently bound to the antibody and not liberated. After binding of the antibody to its cancer cell surface antigen, the ADC is internalized into the cell. Inside the lysosomes, the protease-sensitive unit that links antibody and MMAE is cleaved by cathepsin, releasing the toxic agent only in cancer cells expressing the targeted surface antigen, as shown in the following figure. It took nearly 40 years from the initial bioactive extract to the approved drug. And the way of the bioactive from the cyanobacterium into the slug, from there into the lab and on to total synthesis, and finally to a synthetic derivative coupled to a delivering monoclonal antibody, has not been a very direct one… What a tremendous amount of work this has been! Over the last months, I became more and more aware of the “open” movement. “Open” as in Open Access, Open Source, Open Data, Open Science. In mid 2011, I had a project where I needed to annotate the tandem mass spectra of some cyclic peptides. So I sat down, fragmented the compound structures “on paper” to see what theoretical fragments I would likely find in my spectra, and compared them with my experimental spectra. This was one of the most stupid and boring tasks I had ever done. And it took me more than 2 full days of work to annotate my two spectra. I mused that for such stupid work computers had been invented. mMass is Open Source, so I decided to – just for fun – study its code and try to tweak mMass to do what I wanted. mMass is mostly written in Python, so first of all I again had to sit down and learn this language. Luckily for me, at that time my Python-speaking brother-in-law lived at our place and could give me a good start and support if needed. After many weeks of learning Python, studying the literature for cyclic peptide fragmentation pathways, adding and amending code, in the end the software did what I intended it to do. I again contacted Martin Strohalm and showed him the results of my work. He did like the additions and agreed to include the features into the official mMass source. He of course – me being a novice programmer – needed to revise most of my code, and to correct bugs I had missed. Many, many emails later we were both satisfied with the novel mMass version, which was then released to the public. The novel mMass version was superior to all other tools available for cyclic peptide tandem mass spectrum annotations, so I decided that it was also worthwhile to get the whole thing published in an academic journal, as well. Thus I wrote a manuscript and after some polishing by Martin and me, I submitted it to Analytical Chemistry. Why did I choose Analytical Chemistry? One of the two other tools capable of handling cyclic peptides had been published there, so I thought it would be a suitable place for publishing our superior tool. Just as a side remark: this other, published, software is not open source, and the PI has not been willing to share the code. Well, our manuscript was rejected – one of the reviewers did not understand the purpose of the software, and the other one did not agree with some of the implemented features (funny, because the fragmentation pathways implemented were all taken from the peer-reviewed and published literature…). We amended the manuscript to make it more clear and resubmitted it to Analytical Chemistry. It again was rejected, and to be honest, I did not really understand the reviewers problems. Anyways, I began wondering if Analytical Chemistry was the right place to publish the manuscript. After all, the software and the manuscript were the results of Open Source, so perhaps the paper should be published Open Access. Thus I chose PLoS ONE for the next submission. I have to say that the peer-review was as intense as the one at Analytical Chemistry – but this time we luckily had reviewers who understood the purpose of the software and its potential value. After a minor revision, the paper got published. I would like to use this opportunity to again thank the staff at PLoS ONE for the massive fee waiver. Without this waiver, we would not have been able to publish the manuscript Open Access. I also presented a poster on mMass at the recent ICNPR 2012 in New York and received positive feedback. Yes, huge – but why should it not be effective? Being a natural product scientist, what wondered me most were the comments that followed on Dereks post. In my eyes this compound is not a “big ugly brute” – it is just wonderful! And this is not because natural product scientists in general are crazy, but because I believe in the value of larger compounds, especially if they are peptide-like. There are so many examples of even larger (mostly natural product derived) compounds that are invaluable drugs used in the clinic. “Large” compounds, and even more large and cyclic ones, are a largely unexplored chemical space. For anyone interested in the matter I recommend reading this paper in Nature Reviews Drug Discovery, which very nicely covers the topic and discusses several important “large” compounds in detail (although it sadly is behind the pay wall…). But from my experience I know that there are still many people who need to be convinced of the fact that “large” does not mean “uninteresting” from a drug development point of view. I work with cyanobacteria, and these microorganisms tend to synthesize large compounds. These compounds are often derived from a polyketide synthase / non-ribosomal peptide synthetase biosynthetic pathway, and the “average cyanobacterial compound” has a molecular weight of about 650 Da. So you can imagine that there are many compounds that are even larger than this. However, we often find stunning bioactivities for these compounds. More on this later. Most people’s fears revolve around pharmacokinetics. For example, Derek in his post is somewhat surprised that this compound is actually passing cell membranes and doubts that a compound like this would be orally available. Furthermore, he expects short half-lives for this type of compounds. And this is exactly what I hear when it comes to large peptidic compounds from cyanobacteria: “Peptides are not suitable as drugs because they are not stable in the GIT, they are rapidly degraded by proteases / peptidases, they cannot cross cell membranes and are thus not suitable for intracellular targets.” However, all of these (and more) prejudices are dealt with in the Nature Rev Drug Disc paper mentioned above. When I talk to people about cyanobacterial natural products, I am often confronted with the standpoint that compounds violating the “do not go beyond 500 Da” rule are not suitable as drug substances / leads. I then usually tell three stories about cyanobacterial compounds that clearly show that you can use these compounds in drug discovery and development anyways. Microcystins are known as hepatotoxins produced e.g. by the cyanobacterial genera Microcystis, Oscillatoria, Planktothrix, Nostoc, and Anabaena. They po­tently inhibit the eukaryotic protein phosphatase families PP1 and PP2A1, disrupting intracellular signaling pathways as well as cytoskeleton maintenance. Over 90 natural variants are known, and the average weight of the microcystins is about 1010 Da. The structure of one of the most common microcystins, microcystin LR, is shown below. The WHO has established a limit for microcystins in drinking water (1 µg/L) – now why would the WHO do this if microcystins were not orally available, and stable enough to be toxic after absorption? However, it is true that microcystins – as one could expect – have a poor membrane permeability. Indeed, they need to be actively uptaken by cells to exert toxicity. Three human proteins are able to mediate this uptake, the organic anion transporting polypeptides (OATP) 1B1, 1B3, and 1A2. This “selective” uptake, however, is not a disadvantage. In fact, it can be exploited, and microcystins are currently studied for their potential as leads for anticancer drugs. For more details just have a look at a poster we recently presented at the ICNPR 2012 in New York. Cryptophycins are cyclic depsipeptides found in Nostoc sp.. The structure of cryptophycin-1, 668 Da, is shown below. These compounds show remarkable cytotoxic activity in low picomolar (!) concentrations, and represent the most potent suppressors of microtubule dynamics yet described. They block the cell cycle at the G2/M phase with a 100- to 1000-fold higher activity than paclitaxel and vinblastine, leading to cell death. In addition, they are not effective substrates of the P-glycoprotein, and thus remain active against multidrug-resistant cancer cells. It is not known how they enter the cells, but enter them they do – otherwise they would not find any tubulin to bind to… Eli Lilly and sanofi-aventis both had closer looks at these compounds. Some months ago I had the idea to establish an internet forum, or bulletin board, for natural product scientists. I had much fun setting up, designing and tweaking the board. I even made some advertisement for it, but in the end it turned out that few people registered, and even fewer (none, in fact 😉 ) started discussions or commented on the topics I had started. So here it is – I abandoned the forum, and now start to blog, where feedback from you, the reader, is not as neccessary. Which of course does not mean that your comments are not welcome – please comment below the posts whenever you want to ask or add something! If you are interested in following my thoughts on this blog, just use the RSS functionality to get the blog posts delivered directly to your feed reader!